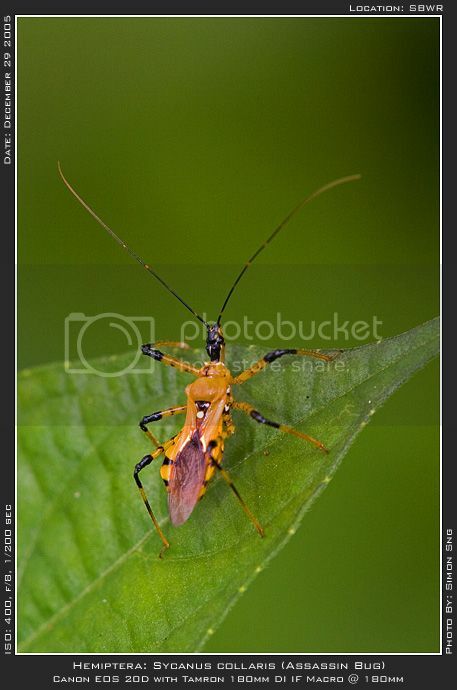 Wow..that is a pretty nice shot of a reduviidae.. you sure this is S.collaris? ?looks slightly different leh..but i only see dead specimen one.. whats SBWR?? Anyway.. at first glance i thought it was some sort of Pselliopus cos of the banded legs.. but the bands on this specimen too far apart..so.. just from photo..i would guess that its probably something in the Rhinocoris genus. Oh..by the way..i think its already parasitised by a fly...if i am not wrong that white dot on its back is where the fly laid its egg which is probably a larvae that is living within it now.. very soon its a$$ would pop open and a fly larvae almost half his size would pop out.... now someone tell me how you cannot love something so adorable..
Last edited by ranmasatome; 31st Dec 2005 at 12:06. Oh..by the way..i think its already a parasitised by a fly...if i am not wrong that white dot on its back is where the fly laid its egg which is probably a larvae that is living within it now.. very soon its a$$ would pop open and a fly larvae almost half his size would pop out.... now someone tell me how you cannot love something so adorable.. help?? help with what?? you cant be joking right?? you mean you dont think its cute meh?? huh?? huh?? ?